GigBAR LT is the ultimate pack-n-go lighting system featuring 2 Moonflowers, 2 LED Washlights, 4 Strobes, all mounted on a single bar plus a stand, FREE carry bag, IRC-6 remote and a wireless footswitch. 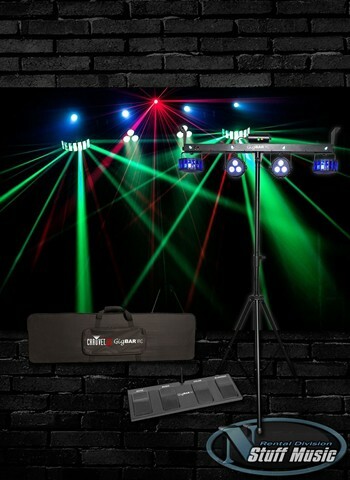 The four high-power LED strobe lights create exciting chase and slow motion effects, and the four individually adjustable and interchangeable heads provide large room or stage coverage. GigBAR LT has phenomenal built-in automated and sound-activated programs that incorporate all 8 lights into one complete show. Control is easy from the display, included IRC-6 remote, wired footswitch or DMX. Master/slave multiple units. Save time running cables and extension cords by power linking multiple units.